I don’t usually buy pre-made cookie dough because I don’t need cookies to be even easier to make and eat. I just don’t. But, I was at the store the other day with Little J and Baby N getting some things for some other posts and a whole package of cookie dough just jumped into my cart. Out of nowhere. And then Little J saw them and there was no going back without a meltdown because it was lunch time and nap time and we were both ready to be done shopping. I’m not sure who would’ve cried harder if I’d put them back, him or me. And sometimes, you just need a cookie. So, I came home and made chocolate chip cookie cups because regular pre-made cookies aren’t something you can blog about. True story. But also because I fooled myself that if I put strawberries on top, it’s a healthy dessert. - Cookie dough. You can make your own or use a pre-made package. The package I used made 2 dozen cookies when made according to the directions on the package. - Lightly spray a muffin tin with cooking spray (olive oil spray is my go-to choice). - Bake at 350F for 15-18 minutes, until cookies are golden brown. 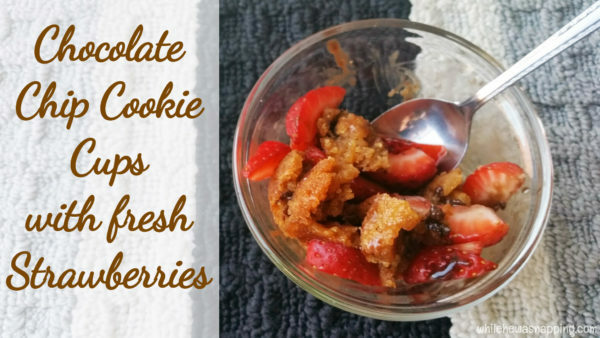 - While the cookies bake, slice up the strawberries. 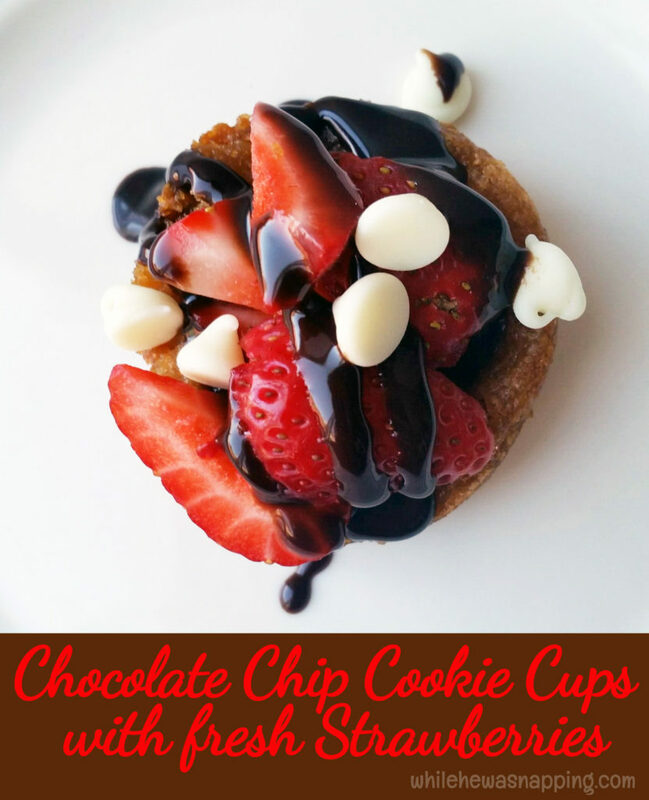 You'll want approximately one strawberry for each cookie cup. 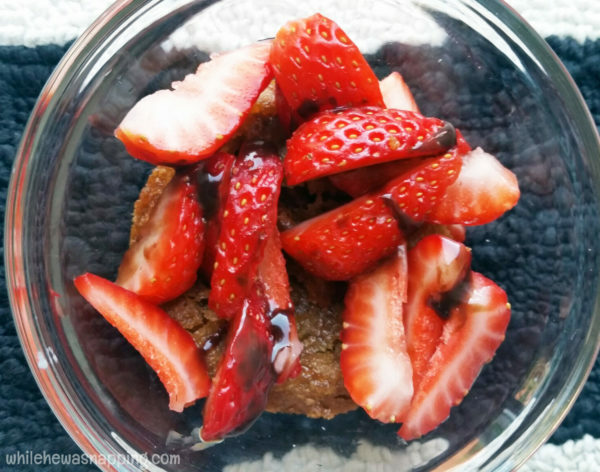 You can coat the strawberries with a little sugar if you want a sweeter, more syrupy treat. Let set while the cookies finish baking. - Let the cookies cool when they come out of the oven until they are cool enough to handle. Transfer each cookie cup out of the muffin tin. 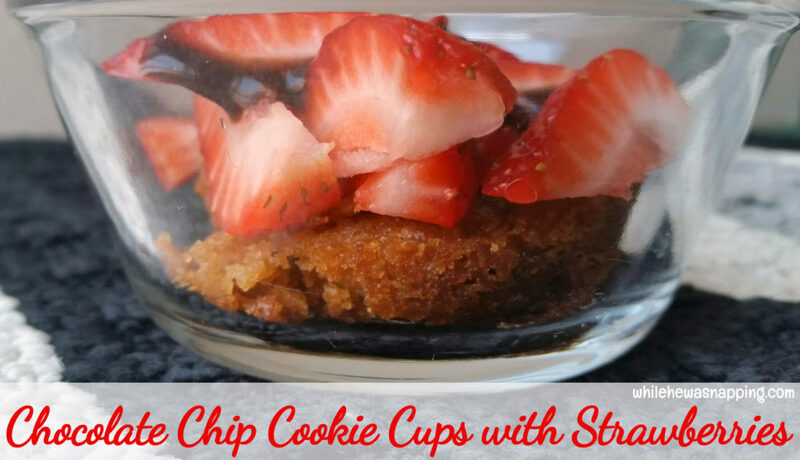 - Place a spoonful of sliced strawberries in each cookie cup. 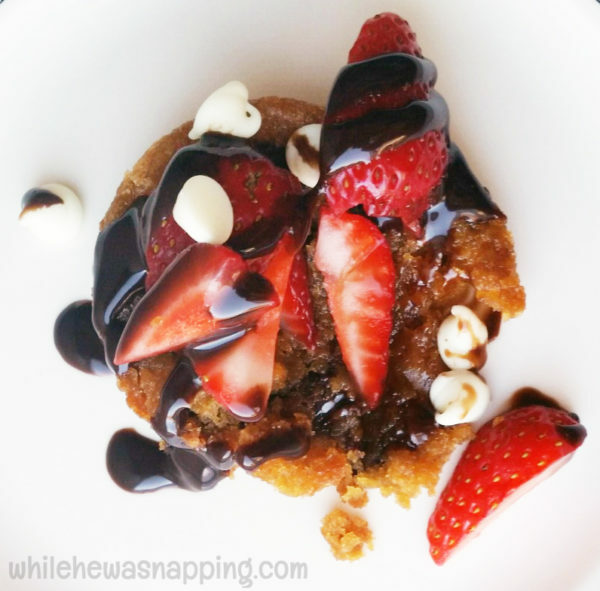 - Top with a drizzle of chocolate syrup and garnish with white chocolate morsels, if desired. Cut down on sugar and calories by omitting the white chocolate morsels (10 cal and 1g sugar) and/or chocolate syrup (17 cal and 3g sugar).